Cat Chant and Marianne Pinhoe have discovered something exciting--something truly precious, very strange, and valuable. An egg. An egg that has been hidden away in an attic for who-knows-how-many years. An egg protected by some strong "Don't Notice" spells. An egg that Marianne gives to Cat, even though he lives at nearby Chrestomanci Castle. Chrestomanci himself, the strongest enchanter in the world, is sure to be interested in the egg--and interference from the Big Man is the "last" thing Marianne's family of secret rogue witches wants. But how much longer can the Pinhoes keep their secrets? Gammer, the leader of the clan, has gone mad, a powerful bad luck spell is wreaking havoc, and there's an unexplained plague of frogs. Not to mention the mysterious barrier Cat finds in the forest. Marianne and Cat may be the only two who can set things right. But first Marianne must accept her own powerful magic, and Cat must uncover the secrets behind the mystical Pinhoe Egg. 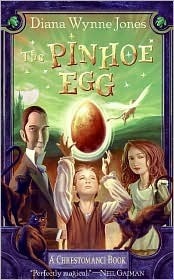 Of all the Chrestomanci books, there is a very high chance that The Pinhoe Egg might be my favourite. In this book we see the return of Cat Chant and Chrestomanci Castle, but we also learn of an interesting conspiracy happening right by the castle that has been going on for years upon years and of a new magic that Cat seems to be full of. Like in The Magicians of Caprona there is a rivalry between families, like in Witch Week there is a variety of points of view including that of lovely, adorable Cat Chant (no I'm not biased towards him at all) and the introduction of Marianne Pinhoe who is a rather underappreciated part of her family clan, although she's supposed to be very important. Once again Jones manages to pull the wool under my eyes and surprise me in the plot. How she keeps managing to do this, I do not know, you'd think that I'd have caught on to her tactics by now after reading so many of her books. Gammer! Gammer you nutcase! I cannot believe that she twisted everyone into thinking she was harmless except Marianne and then did all those horrible things that came back to them. What really took me by surprise was the whole warping of history that happened in these families, who originally supposed to protect the magical creatures of the land, but instead forgot why and thought they were imprisoning them. The Griffin was entirely too adorable as well and made me remember fondly Jone's Dark Lord of Derkholm and The Year of the Griffin books which handled griffins in a similar way (smart and people-like). The way Cat loved that griffin however strikes me as the most adorable thing ever. And finally, due to Marianne being an enchantress, I think she and Cat would do well in the future, and I will continue to imagine that is their future path in my brain. All that's left of Chrestomanci after this book is a few short stories. I'm so glad I picked this series up and I plan on rereading the someday in Diana Wynne Jone's suggested reading order (which is different than publishing order). The last two are my favourites followed by Charmed Life.